Shortly after the release of their debut album Full Tilt, Randy Weitzel and Jimmy Shultz recruited guitarist Steve Marshall and bassist Elaina Bangma to their band Three Thirteen. To better familiarise themselves with each others' music styles and abilities--all while paying tribute to their rock idols--they recorded the cover song EP Devil Music. The grand introduction of the EP begins with a static radio tuning noise that goes into, "Hey metalheads, strap yourselves in for a non-stop metal block...this is Three Thirteen Devil Music!" Then, in a very tongue-in-cheek manner, there are voices yelling "Hail Satan!" sounding like they come from a vintage horror flick. The first cover Three Thirteen unleashes upon us is "It's a Long Way to the Top (If You Wanna Rock 'n' Roll)". Nobody can be Bon Scott other than Bon Scott, so the vocals on this song are more subdued here than in the original. They do not lack in attitude, however, and the "huah!" grunts add a certain amount of ballsiness. There aren't any of the infamous bagpipes here either, but who else besides AC/DC would gamble with the bagpipes? In lieu of the bagpipes, the blistering and squealing guitar fills in quite nicely. Next is "Rocket Ride," which has never been one of my favourite KISS songs, but I actually enjoyed Three Thirteen's cover of it. Coming from KISS, the song just always came off as nasty and weird. This version is performed with a smarmy attitude that better suits the song, making it sexier and edgier. The explosive guitar work of Weitzel and Marshall give this song the Ace Frehley-inspired explosive firework playing this song deserved, and overall, the band does a good job of putting their own spin on the sound of such an iconic band. If you've listened to their debut album Full Tilt, you can tell KISS is a major influence on Three Thirteen. Three Thirteen's version of "Beer Drinkers and Hell Raisers" is a bit heavier than the original ZZ Top version, but they're a heavier band--so that's to be expected. It seems a little bit faster too, and it's almost like the underlying riff and bass line have a '80s Ozzy feel to them. The impeccable Billy Gibbons and ZZ Top originally recorded this song during their bluesier, grittier period of the 1970s, but I think this cool cover is what this song might have sounded like, had it been written and recorded in the '80s. When I read that a cover of Anthrax's "Caught in a Mosh" would be included on Devil Music, I was really intrigued, because I always get excited when a band covers Anthrax. This track starts out faster and more aggressive than the original, and it also has more of a "driving" rhythm. Parts of this cover sound tighter and more precise than the original, especially the refrain of "What is it? Caught in a mosh!" This part is almost monotonous, but not bad. This song really kicks into high gear during the last two minutes, which really helps to project the image of the mad dog from the album cover. The last verse is very interesting, because a lyric change incorporates part of Led Zeppelin's "Black Dog," then it goes straight back into the original Anthrax lyrics. Speaking of Zeppelin, right after they make an appearance in "Caught In a Mosh," there is a cover of "Ramble On". It is definitely mellow compared to the previous tracks, but I instantly enjoyed it and think it is the best track from Devil Music. Three Thirteen has taken this laid-back rock classic and added some heavier riffs and grittier vocals. It really stands out, and it doesn't sound like a Led Zeppelin impostor. I've always believed for a cover song to be truly great, it must be spot on to the original or be DIFFERENT. Three Thirteen's "Ramble On" certainly achieves that goal. The last song from the EP is "We're Not Gonna Take It". I've really been digging Twisted Sister lately, so the inclusion of this song was a pleasant and fun surprise. It is MUCH faster than the original, and it almost has a punk feel--especially in the drumming. The song is heavy on the cowbell, and the vocals are somewhat muffled and distorted as well. Punk is not my cup of tea in the least, but I can see how this musical style fits the message and lyrical themes of this song. This is a different interpretation, especially for a metal band to take on, and I totally applaud that. The Devil Music EP ends with a nice horror-inspired "Welcome to HELLLLL" followed by a concert advert repeating the band name and the members names-- Weitzel! Marshall! Bangma! Shultz!" If you didn't know the names before, you'd know them now. This outro features the same static radio tuning as the intro, and this really helps to tie the mix of songs together. 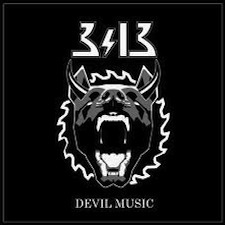 Three Thirteen's Devil Music EP is a good re-imaging of each of the songs--all with some added heaviness. Upon hearing this variety of songs, one can definitely tell that band listened to (and enjoyed) these songs from the '70s and '80s. It really ties into their debut album Full Tilt, which is heavily influenced by these songs and the bands that were covered on the EP. Three Thirteen's rendition of the Led Zeppelin classic, "Ramble On", is surely a stand-out track and worth checking out!